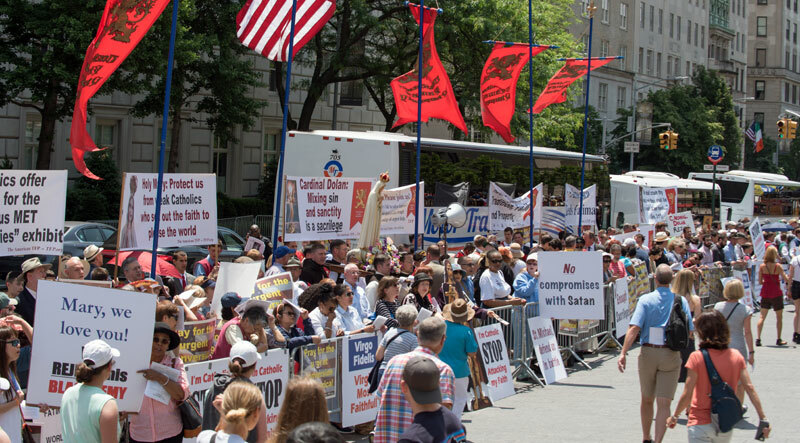 It was not without some anxiety that I got into the van to travel some three hours to our protest in front of New York City’s Metropolitan Museum of Art on June 9. Even if only a few people showed up, I had resolved to be there. We would be protesting the “Heavenly Bodies: Fashion and the Catholic Imagination” exhibition. Catholics nationwide were indignant over this show which mixed sacred symbols and Catholic imagery with immodest haute couture fashion. The Gala event inaugurating the exhibition on May 7 added insult to injury with a show of scantily clad celebrities in religious-themed clothes. 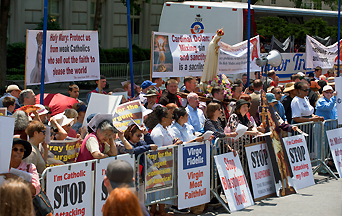 The protest rally of reparation was organized by the American Society for the Defense of Tradition, Family and Property (TFP) and its America Needs Fatima campaign. We knew people were committed to being there, but we did not know what to expect on the actual day. Hence, my anxiety. As I found myself in front of the massive and majestic façade of the Metropolitan Museum, I was hoping for the best. It was a beautiful day and there were a lot of people on the street. The location could not have been better. The large staircase in front to the building formed a kind of giant amphitheater for us. Our voices, the bagpipes and drums would bounce off the surroundings to excellent effect. The police were helpful and had barricades to ensure that sidewalk traffic would not be impeded, and unruly elements would be kept out. 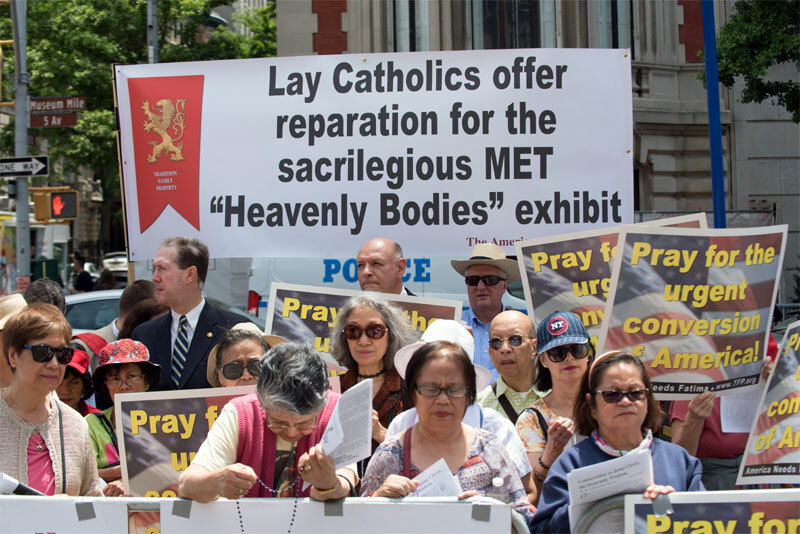 Lay Catholics offer reparation for the sacrilegious MET “Heavenly Bodies” exhibit. We were early as we unloaded the van. No one was there. Then, a curious onlooker approached and identified himself as a protester. He was soon joined by a few more. And then everything became a whirlwind of activity as people started arriving from everywhere. I do not remember when the event came together. All I recall is that people started to gather in the designated place. Placards were distributed all around. Banners went up. The American flag and TFP standards were hoisted. The statue of Our Lady of Fatima processed in to the acclaim of the crowd and the accompaniment of bagpipes and drums. Suddenly, almost like magic, a protest was on. And a grand protest it was! The crowd gradually expanded until there were some 600 Catholics praying, singing and protesting. The police kept expanding the barricades until the throng spanned the whole city block. What impressed me most about the rally was the energy of those Catholics who attended. Most of them were from New York. They were invigorated by the event. They wanted to be there. They were indignant by the offense against Our Lady and prayed loudly, sang loudly, protested loudly—in a characteristic brusque New York manner. 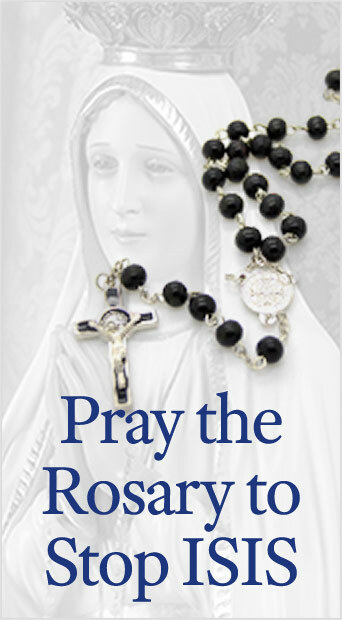 The energy was contagious as some onlookers on the stairs could be seen joining in on the rosary. As I scanned the ranks of the faithful at the rally, I saw many old friends who drove great distances to be there. Others organized vanloads of people. A few buses from Pennsylvania and one from Boston pulled up to swell our ranks. A school bus from the TFP Call to Chivalry Camp was there much to the delight of the young boys. Many made great sacrifices to be with us. The sidewalks and staircase were crowded with people who were astonished by the unexpected spectacle. At times, it seemed like a sea of uplifted i-phones as people scrambled to get the scene on their social media. I sensed that people saw that this was serious stuff. We were something to be reckoned with. Those who were upset by the protest were concerned. There who tried to be indifferent feigned apathy. There were those who secretly loved Our Lady and were consoled by our presence… and even joined us. “It feels good to be Catholic again” was one comment of a lady who expressed the spirit of the rally. People were proud to be Catholic because we were defending Our Lady. We felt a certain joy at being allowed to be ourselves without politically correct shackles. It was as if a great weight was taken from our shoulders. This Catholic pride had a great unifying and electrifying effect upon the crowd. Time passed slowly during the hour and a half rally of reparation. It seemed to last a long time and everyone savored the moments. At the end, everyone lingered around, talking and enjoying the final moments of being together. What I saw at the Met protest was much more than I expected. I was impressed by this display of Catholic militancy for which we are all called by the Sacrament of Confirmation. Indeed, it felt good to be Catholic again, and the scene awakened in me hope for the future. This entry was posted in Anti-Blasphemy, Catholic Perspective, Events of 2018, Fighting the Culture War and tagged "Heavenly Bodies", 2018, anti-blasphemy, blasphemy, Catholic, Catholic Church, fashion, Heavenly Bodies: Fashion and the Catholic Imagination, Metropolitan Museum of Art, protest, rally, reparation, rosary, sacrilege, The Met by John Horvat II. Bookmark the permalink.